After 17 years of research involving NETL, industry partners and a high-tech research group known as the AUSC Consortium, significant progress is being made toward scaling up the fabrication of components made from advanced nickel superalloys that will help bring advanced ultrasupercritical (AUSC) power plant technology to the level of readiness for commercial-scale demonstration. In the 1950s, coal-fired power plants operated at a then cutting-edge steam pressure of 2400 psi and main steam temperatures of up to 538°C. They were known as ’subcritical’. Increasing the pressure and temperature of a power plant can increase power plant efficiency, and by the end of the 20th century, new coal-fired power plants were designed for ‘supercritical’ steam conditions where steam conditions and power plant efficiency were as high as 610°C, 4300 psia and 41%. Further, increases in power plant efficiency continue to be sought to reduce the cost of power generation and carbon capture. A new generation of AUSC power plants is viewed as a promising way to attain those goals. AUSC technology is designed to help power plants burn less coal for electricity production while reducing CO2 emissions. AUSC power plants can potentially operate at temperatures and pressures higher than current state-of the-art coal-fired power plants – about 25% more efficient than the average US coal-fired power plant fleet, and 10% more efficient than state-of-the-art coal-fired power plants. AUSC power plants would require less coal per megawatt-hour, resulting in lower emissions of CO2 and mercury, and lower fuel costs per megawatt. AUSC technology requires fabrication of advanced nickel superalloys into large plant components; development of installation and repair methods for the nickel superalloy components; and enough testing and metallurgical analysis to support the final design of a commercial-scale AUSC demonstration plant. NETL researchers and programme managers began working on AUSC technology in the early 2000s when the Department of Energy (DOE) began funding research projects to identify and develop materials that would be needed to operate coal-fired AUSC steam power cycles to temperatures and pressures as high as 760°C and 5000 psi. That’s when DOE and NETL awarded co-operative agreements with private sector partner Energy Industries of Ohio (EIO) for work on advanced materials for boilers and steam turbines. Manufacturers participating in those early projects including Alstom, Babcock and Wilcox; Foster Wheeler, Riley Power; General Electric and Siemens. By 2015, research demonstrated that nickel superalloys Inconel 740 and Haynes H282 have the fabricability, castability, long-term mechanical strength, and corrosion/steam oxidation resistance properties necessary for fossil energy power plants operating up to 760°C and 5000 psi steam conditions. The overall technical goal of the current AUSC project with EIO, ‘Advanced Ultrasupercritical (AUSC) Component Testing’, is to significantly advance technology readiness of AUSC technology by manufacturing full-scale AUSC components from nickel superalloys and other advanced alloys. The size of the components that will be fabricated correspond to a coal-fired power plant of approximately 800 MW generation capacity operating at a steam temperature of 760°C (1400°F) and steam pressure of at least 238 bars (3500 psia). The specific components that will be fabricated under the scope of this project include an AUSC superheater tube assembly, large diameter thick wall pipe and pipe fittings, an AUSC steam turbine rotor and an AUSC steam turbine nozzle carrier casting. R&D in the last 17 years has resulted in many material development successes and accomplishments that not only impact the progress toward a demonstration AUSC power plant by 2025, but also that are transferable to other industries, including development of nickel superalloy casting, development of welding technologies and fabrication processes; identification and testing of alloys and coatings that are resistant to steamside oxidation and fireside corrosion at AUSC conditions; and approval by the American Society of Mechanical Engineers boiler and pressure vessel Code Committee for use of Inconel 740 in power plants. The project completed multiple AUSC boiler designs and found that the price of nickel (especially the steam piping) is critical to the economic analysis which show that AUSC technology is more cost effective than other technologies for reducing CO2 emissions. For oxy-combustion technology, the boiler size is similar to air firing and reductions in the quantity of convection pass tubing are possible. Higher feedwater temperatures and membrane wall temperatures need to be addressed by materials or design changes from current USC boilers. Boiler dynamic modeling provided quantitative insights into maximum ramp rates and controls for cycling of an AUSC boiler. Materials exist that can meet equipment design requirements for 760°C and 5000 psi internal pressure. 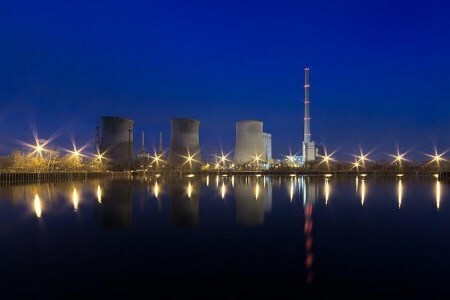 Long-term creep testing (20 000 - 95 000 hours to failure) for alloys 740/617/S304H/230 was vital for assessing material stability and providing the confidence to use these materials in FE power plants. Improvements were made in the ASME code for boilers and pressure piping (e.g., cold work rules and weld strength reduction factors). Novel testing approaches were developed (e.g., tube bends, thermal shock, large specimen creep, notches). No systematic effect of pressure on steam side oxidation was found. Extensive lab test data to 10 000 hours showed that nickel-based alloys are resistant to steam oxidation. Over 450 lab and field probe samples were tested to identify suitable materials. Protective overlays can provide adequate fireside corrosion protection for boiler tubes against aggressive high sulfur coals. A steam loop test of AUSC alloys in a commercial coal fired boiler was operated at temperatures >1400°F (760°C), and was critical to building utility industry confidence and moving to next stage of AUSC technology development. Over 30 combinations of materials, weld metals and processes were qualified. Early cracking problems in welds of Inconel 740 alloy were solved through a focused R&D effort that resulted in an optimised 740H alloy which can be reliably welded up to 3.5 in. section thickness. Weldment strength debit of 30% for welded nickel superalloy pressure components is not a significant detriment for the maximum pressure carrying capacity (limit load) of expected weldment designs. AUSC nickel alloys can be formed into required shapes using typical boiler fabrication processes, such as bending, extrusion and machining. Composite waterwall tubing with a high strength nickel layer on the hot-side of a less expensive alloy (e.g., such as alloy 617 clad over T23 base tubing) increases the maximum allowable pressures significantly over the ASME Section I design method. First demonstration of triple-melt Haynes 282 ingots. Successful development of the Haynes 282 forging process culminating in the forging of a 44 in. dia. disc. Detailed characterisation of the forged disc which showed excellent grain size control through careful process control resulting in superior fatigue, creep-fatigue (hold-time fatigue) and tensile properties in comparison to the standard Haynes 282 product. Development of welding and weld repair technologies for casting and joining the turbine to the boiler steam piping (casting to forging welding). Long-term property development and microstructural stability of all key nickel superalloy candidate alloys. Create a domestic supply chain for AUSC components and minimize the risk for AUSC plant development. Validate advanced design and life prediction methods for AUSC components that are made from nickel superalloys and other advanced creep resistant alloys in both steady state and cycling operating modes. Validate the ability to design nickel superalloy and other AUSC components for operating life of at least 30 years. Validate through design and fabrication that AUSC components can be designed and built for reliable operation under both steady state and varying load operating conditions. Develop and validate fabrication, installation and repair methods for cast and forged nickel superalloy AUSC power plant components and sub-assemblies.